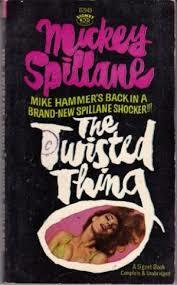 I have read a few Mickey Spillane works, and what hits one most, quite frightening, is the violence in the books. It is often more than gratuitous, brutal. Tremendous ruthless battles and fights, blood spilling out from guts and nerves and from pretty much everywhere. It is no different here, the brutality of the fights involving Mike Hammer. If he is not a sadist, then one wonders what a sadist is! Yet this novel, the story is quite good and i daresay convincing. The psychology behind the trend of events, the flow, the "twisted" youngster himself is quite spot on. Do we at the end feel pity for the boy genius? I like the undulations of the way he (the boy genius) has fallen for the lady in question here, though she is much older and would regard him as a child. But psychologically and emotionally he is no kid. He is very intelligent cerebral and calculating. Which all adds to the pathos of this hard-hitting story, I suppose.